Instant History, by Richard Tipping (Flying Island Books), was launched by Jean Kent at Poetry at the Pub, in Newcastle on 18th April 2018. Richard had already published two collections by this time, and was a significant presence on the poetry scene. I didn’t know him personally, but I was certainly aware of his poetry. In the years since then, he became known both in Australia and internationally for his visual poems and his sculptural poems, many of which are now held in art galleries. But he has always also been a writer of finely crafted poems for the page, and Instant History is an important reminder of that. In the beautifully produced, palm-sized format of all Flying Islands books, Instant History may look small, but in fact it is an extraordinarily large collection. Not only are there a lot of poems, their range is also vast. Thirty plus years of life and observation are distilled here, in the typical Tipping style, with dazzling wit, playfulness, precision and clarity. Richard’s delight in words is (to use one of his own words about the book) multifarious: simply reading the title and the names of the different sections – The Postcard Life, Rush Hour in the Poetry Library, Earth Heart, Kind of Yeah – suggests how he loves the slipperiness of meaning. 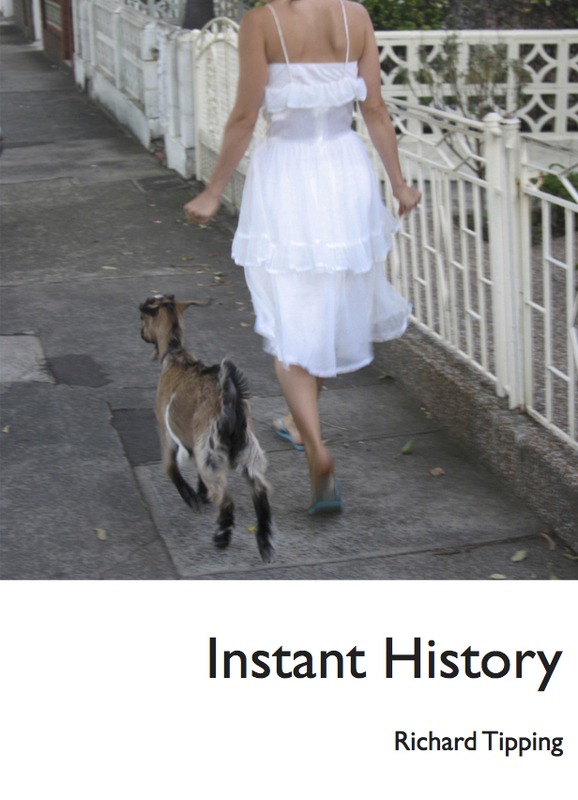 Even the title Instant History can be understood in so many ways. Is it immediate history? The history of small instances? Or a nod to the way so much of our lives now is captured by the media and then forgotten? Considering Richard’s gift for plucking the right couple of words out of air as if this is as natural as breathing, we might think it’s just another of his serendipitous , but very clever throwaway phrases … until we realize that there is also a poem in the book called ‘Instant History’. Richard has been a film maker, visual artist and musician, as well as a poet, and his talents in all these areas are obvious in the poems. He has also travelled extensively, so not surprisingly there is a global awareness in much of his writing. There are poems of social and political commentary, postcards from everywhere, riddles, lyrics, meditations … and so many memorable phrases. I don’t have time tonight to offer more than a small glimpse into the surprises and treasures Instant History contains. But I’d like to mention one of my favourite poems from the travel section. There are also tantalizing examples in Instant History of Richard’s typographic and sculptural poems, including one which is in the grounds of Lake Macquarie Art Gallery. This ‘earth sculpture’ consists of bricks laid into the grass in a circle. From the air, the bricks clearly form letters, which spell out Richard’s title of the work: ‘HEAR THE ART (EARTH HEART)’. There are no gaps between the letters, so if you are at ground level, you have to walk slowly around the circle to make sense of it … Other words then start to form – like ‘HEART’ and ‘EARTH’ and ‘HEARTH’. It’s a classic Richard Tipping concrete poem—surprising, enigmatic, charming and clever. This poem in the earth is much loved by the swallows that live by the lake—they swoop and dive and circle around the bricks, “quick-dancing in the rising wind”, as Richard aptly describes them in a related poem. In this book as a whole, I think there is also a dazzling combination of aerial views and close attention at ground level. Instant History is a book to dip into, like the swallows, for light-hearted joy, but it is also a complex, comprehensive response to the experience of living in our times, a ‘his-story’ which rewards careful, serious reading. This entry was posted in Flying Island Books, Instant History, issue 25, Jean Kent, Richard Tipping and tagged Australian poetry, Book Launch, poetry by Mark Roberts. Bookmark the permalink.